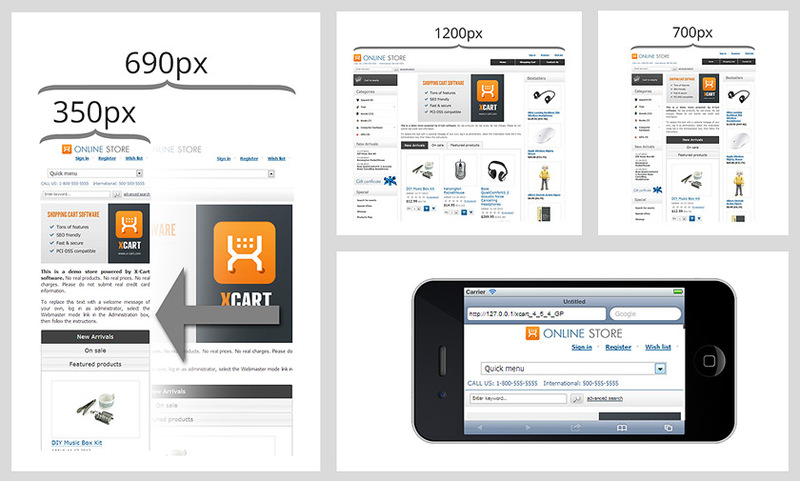 We are excited to announce the Responsive Template for X-cart! This template created by our xcart-guru - Mike White aka totaltec - and we are glad to demonstrate this add-on directly on our website. I would like to know more details about this module. It looks interesting to me. Is it built on 960 Grid System (http://960.gs)? If yes this is a huge step forward for XC and a great addition even the price is a little bit expensive! No it is not. Though there are a number of nice projects out there, like 960.gs and Twitter's Bootstrap, it was built from the ground up without any of these extra elements. The idea was to modify as little code as possible, and not add anything to XC's underlying structure. XC already has many CSS classes and custom code implementations of libraries like jQuery. The main idea behind this template was to simply provide the basis of responsive design, to a familiar template (ideal_comfort), while modifying the core as little as possible. You have included style sheets that deal with the different device widths, special code to deal with popups on small screens, and the removal of a multitude of tables. Much care has been taken to ensure that every aspect of XC was considered, all the elements/pages/sections are responsive, not just the main pages. The result is that you can give your "full website" experience to your mobile and tablet customers, without sacrificing anything for those on larger screens. Small screens (down to 350px) will be presented with content that is legible without zooming and panning, and large monitors can be filled up to 1280px wide. The "base" size is indeed 960px. This template is designed as a base for new XC stores, or as a starting point for that much needed redesign/upgrade. Simply installing this template will not make your existing site responsive (of course) but it will provide that structure for your new site design. Thanks Mike for your reply. You did a great job. A new start for thinking XC templates as you said. Those who bought your module taking the advantage of Christmas discounts will appreciate it. With that said Alex - where does XC stand to have all of its default skins responsive and moved to html5/css3? Will this affect the ability to update X-Cart much? I am interested in this, as I update my site from 4.4.2, but in the update, I want to keep X-cart as "stock" as possible to make future upgrades at least a bit less painful... (I currently have a few mods installed, as well as a custom 3rd party design).